Last year, I had a very disciplined summer schedule for the kiddos (Summer Activities and Ideas). I started out with good intentions but as the summer rolled on and laziness set in...well, you know, we didn't finish in the same way we started. As I looked over the list today, I realized it does have some really great ideas but I am not going to set myself up this year. :) However, I will re-visit it from time to time. I have thought about this for several weeks. What is the most important bargaining tool I have? I could sit here and say that my kids are never interested in the iPad or TV. Yes, they always beg to go outside and work during the summer...NOT. They are normal kids! If I let them they will waste 8 hours a day in front of some sort of electronic device. Honestly, with our summer heat I can't say that I blame them. Our outside playing hours are usually between 6pm and 9pm when the temperatures go into the low 90's (insert sweaty emoticon). So, here is the plan for this summer. The kids will earn screen time by reading, completing educational packets, and chores. Each item is worth a specific amount of points. Each time they complete an item I will give them a ticket for each point. They must have 30 points (tickets) in order to earn 30 minutes of screen time. I had my oldest son help me with the list and point values. He is always my hardest one to convince with things like this. I have learned if he helps in the planning phase he buys into it a little better. 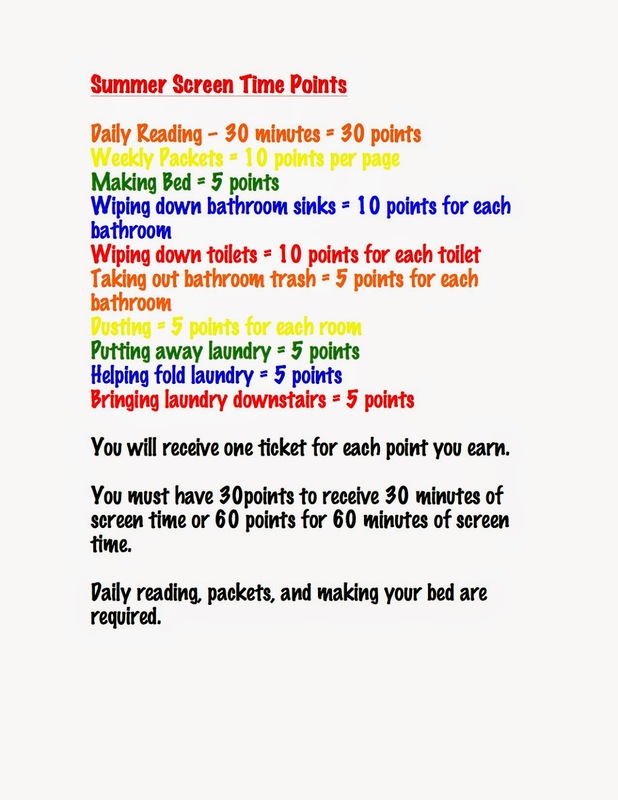 *Reading, educational packets, and making their bed will be required on a daily basis, however, they will get the benefit of receiving points and tickets. * After clicking (click here to print), you will be sent to a Google Doc page. From there select "file", then select "download". The image will download to your computer and then you can print from there.